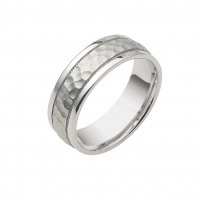 Our Hammered Swish wedding band is manufactured with a center section with a unique hammered finish, without forgetting the milgrain detailing that is adjacent to the high polish rims. That design choice allows for a discrete definition between the shinny rims and the more rugged look of the center section. You also have a choice of gold color from our drop down menu to select the gold color of the center hammered section for an entirely unique look. 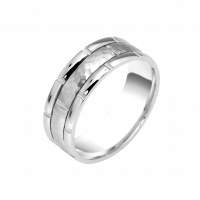 The middle part of the ring can be made in white, yellow, or rose gold. 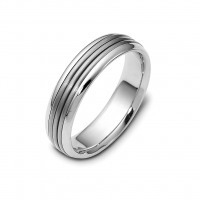 The band is made in solid white gold and is 1.8 mm thick. It is available in 10k, 14k, and 18k gold. Please use our filter to find your perfect ring or contact us if you cannot find what you're looking for.